Acai berry benefits that will rev your energy levels through the roof! Fruit smoothie recipes are a great way to add healthy acai berry benefits to any diet. This berry has been making its way through the news and into a number of diets and other health related regimes. It is not hard to see why. What Does Acai Fruit Look Like? The Acai is a palm tree, which grows in South America. It is a common berry and is often used in a variety of forms as a dessert, part of a marinade, and an additive to a variety of other dishes. The berries are small, purple-black and round. They look similar in appearance to a grape but have considerably less pulp than can be found on most grapes. Unripe berries will appear green in color and slowly darken as maturity is reached. The most acai berry benefits come from the ripe fruit. This is when the fruit is at the peak of its nutritional value. Unfortunately, if you live outside of the growing region you will not be able to enjoy freshly picked right off the palm tree. These berries have a short freshness span after being picked. 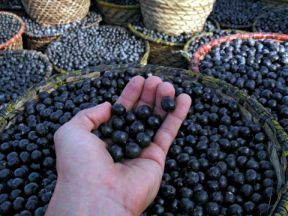 It is because of this that the acai berry is often dried and powered. This makes it perfect for supplements and as a powered based additive to smoothies. Recently, it has become possible to obtain this fruit in frozen form and as with dried. It is also available in juice form. This form is slightly more expensive, but does make a wonderful and nutritious addition to fruit smoothie recipes. 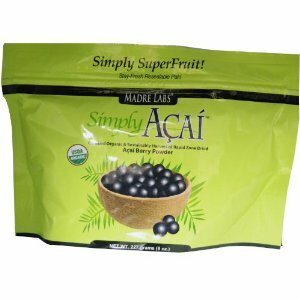 Some of the acai berry benefits that have been attributed to this fruit are increased energy levels, detoxification properties, a high fiber and antioxidant content as well as assistance with weight loss plans. Two of the biggest benefits are the high fiber content and the high level of antioxidants found in acai berry. The acai berry has been found to have high fiber content. This is due to the nature of the pulp and one of the reasons why dried whole or frozen berries should be considered for smoothies. Fruit smoothie recipes are designed to be healthy for you and provide you with a wide variety of benefits. Fiber and all! Detoxification is one of the benefits of fiber. In order to do this you need both a high level of fiber which helps to move toxic materials through the body. And you also need the benefits of antioxidants which help the body remove toxins from cells as well as helping to prevent and heal the damage toxins can do. One unique benefit of acai berries is that that they contain omega 3 fatty acids. Not many fruits contain this needed nutrient. Omega 3's help with brain function and joint inflammation. That way you can remember to blend up your daily nutrient dense smoothie. Just kidding! What Does the Acai Berry Taste Like? Another of the acai berry benefits is the taste. While it may seem odd at first the acai berry actually tastes like chocolate and a combination of berries. This is one of the reasons why it is often used in and as a dessert. It is also not that sweet so it is perfect for people who want the benefits but do not want to sweeten their smoothies overly, something that can happen when mixing a number of berries and fruits together. The chocolate and berry flavor adds a unique twist to any smoothie and the dark purple color adds a splash of fun. Both the color and the flavor will make it easier to get your family to enjoy the benefits of a healthier lifestyle. There are a few things to consider when using acai berry. The first thing is that you need to store it in an airtight container if it is powdered or dried. This will help to maintain freshness. If it is juice depending on the type you purchase you may need keep it refrigerated or refrigerate after opening. Juice should also be used usually within three days of opening in order to maintain freshness. Acai Powder from iHerb.com is perfect for smoothies! There are a number of places that sell acai berry products so it is important to price shop. Because of the fact that this fruit has resisted cultivation in other locations, it is an import. Also, because the berry is small and yields only a small amount of material per berry, it is priced accordingly. However it is important to be aware of the ingredients in products. Acai berry benefits come from the berry itself but often times products are mixed with other types of fruits, materials, or even other berries in order to reduce the overall cost. Unfortunately it also reduces the benefits you and your family can achieve by obtaining this fruit and using it in your smoothies. In addition, dried, juiced, powdered or frozen can be used in smoothies so there are plenty of options for price shopping and use.